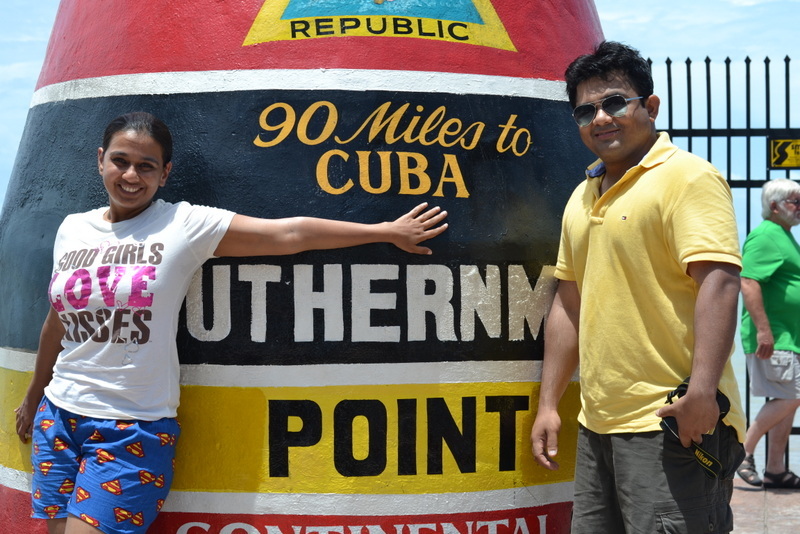 The first thing we did on reaching Key West was stand in line, like all dutiful tourists for the obligatory photo with the 90 Miles from Cuba buoy. This buoy wrongly claims to be the southernmost point of contiguous 48 states. Ballast Key, a little further down the same coast is around a minute and a half more south. 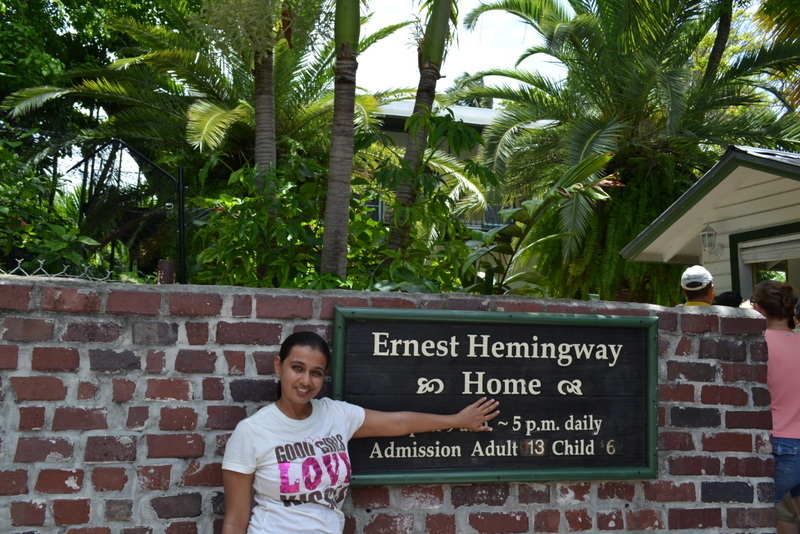 Our day in Key West, was dedicated to adventure sports. We signed up for what was advertised as a 5 hour long all in one adventure package. 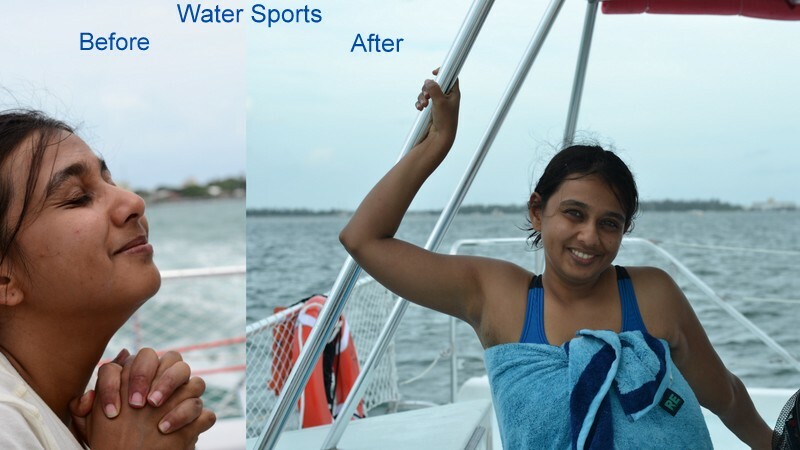 According to the brochure, we were to try our hands at kayaking, paddling, snorkeling, knee boarding, wind surfing, sailing, jet skiing, riding wave runners, banana boat rides, and for an additional fee, para-sailing. We started with snorkeling. We expected a lot of people to be interested in snorkeling, but we were the only two who set out. All the better for us. We kayaked over to a little shipwreck, pulled on our snorkel masks and plunged into the ocean. Even though the visibility was a little low, the experience was quite sublime. It was as though one was swimming in a fish tank. Schools of tiny tetra-like fish flitted past. Although it wasn’t like anything they show on discovery channel, we did see corals and some beautiful fish.Getting off the kayak was easy, but getting back in posed a problem. Instead of doing the sensible thing, which is pushing the kayak to a shallower part and climbing in, we decided to clamber over the slippery shipwreck and lower ourselves into it. Now when you say jet skis, the typical Indian mind pictures Sharmila Tagore being pulled behind a boat with Shammi Kapoor serenading her from a helicopter. Turns out what they meant was just scooterboats or waverunners.We got back to base boat in time to take a banana boat ride to the wave runners. A wave runner or a scooterboat is one of those little crafts you see Akshay Kumar do stunts on. Now, I’ve ridden a wave runner before, but then the controls were secretly handled by a person riding behind. This gives the rider a (false) sense of achievement but reduces the risk greatly. This time, it was different. We were given instructions on how to control the craft and set loose in the ocean. If you go really fast, the waves make the scooter jump. The salt spray hits your eyes, making it difficult to look ahead. It was thrilling! Due to weather conditions, a lot of the sports like paddling and knee boarding were cancelled. So,we grabbed our burgers waited for our turn to para-sail. Yes, I got a veggie burger, and it was surprisingly good. Our last activity for the day was para-sailing. Given that it was sunset hour, it was just perfect timing. However, due to cloud cover, the sky stayed grey. 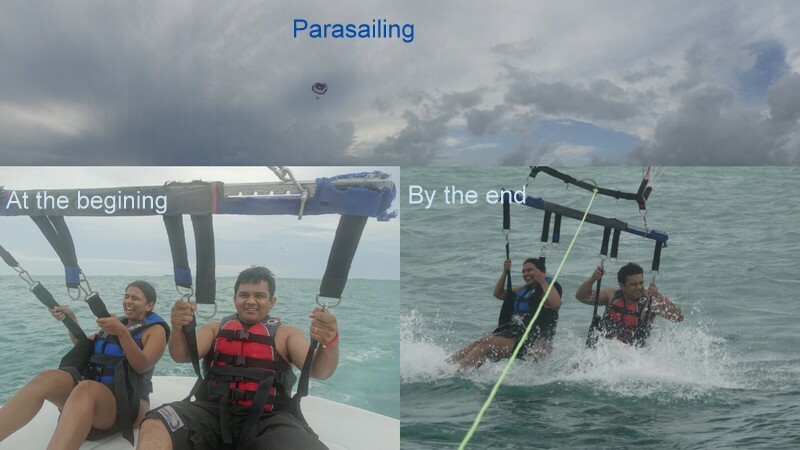 The last time I went para-sailing, it was a very different experience. We were guinea pigs for Air force pilots training to be para-sailing instructors. On hot summer mornings in Nagpur, we would allow ourselves to be strapped into para-sailing gear and tied behind jeeps. We would run a short run behind the moving jeeps and running, get lifted off our feet.The air was so hot, that on one trip/flight, I stayed up in the sky even after the jeep had stopped, and had to be reeled in like a kite! This time we took off from boats and had a bird’s eye view of the entire ocean. The whole feeling was quite extraordinary. Although I still clung to the straps for my dear life, having somebody up there with me, in this case the Husband, made me feel a lot more confident. The all in one adventure package had promised to exhaust, but at the end of the day, I felt rather rejuvenated.